1. Preheat oven to 180°. Place the pan or skillet on the burner over low heat and add butter. Once the butter melts, add 85 grams of brown sugar and stir it gently. When the brown sugar has melted, turn off the heat, but leave the pan on the stove. 2. Core and coarsely grate 2 apples and finely slice the remaining apples. Arrange the sliced apple in the pan, being sure to crowd the pan as much as possible. The fruit will shrink when cooked. If you are using mint or any other herb, then sprinkle them on top of the fruit layer. 3. Combine the flour, remaining sugar, soda and cinnamon powder in a bowl. In a separate bowl, combine oil, water, vinegar, grated apple and lemon zest. Mix the dry ingredients with wet, quickly but thoroughly. Add in the chopped walnuts. 4. Bake for 50-55 minutes or till a toothpick inserted near the center comes out clean. Place the cake on a cooling rack. Let the cake settle for a minute or two until any fruit that has leaked up the sides stop bubbling. Do not let the cake cool completely or you will not be able to get it out of the pan. Run a knife around the edges of the pan, place a plate on top of the pan and, using hot pads, carefully flip the cake over. Gently remove the pan. Be careful the fruit and glaze will be still quite hot and will burn. 5. 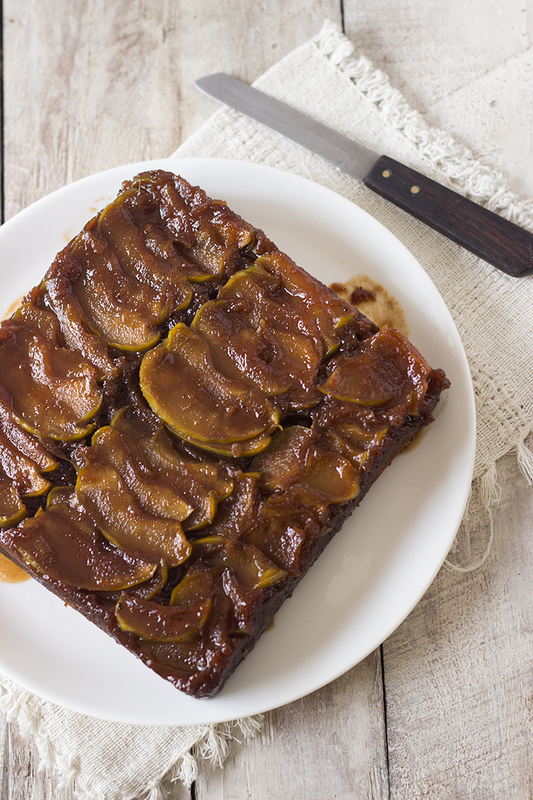 If any pieces of fruit is stuck on the pan, gently scrape them and replace on the cake. Let the cake cool. Serve at room temperature or slightly warm. You can serve with whipped cream or ice-cream. The taste of walnuts and grated apples is the winner here. I used the sugar quantity as given in original recipe of 195 grams but found it a tad bit too sweet for my taste so have reduced the sugar in the recipe. If you prefer more sweet, then go ahead and use the original quantity. It tastes best when had with vanilla ice-cream.